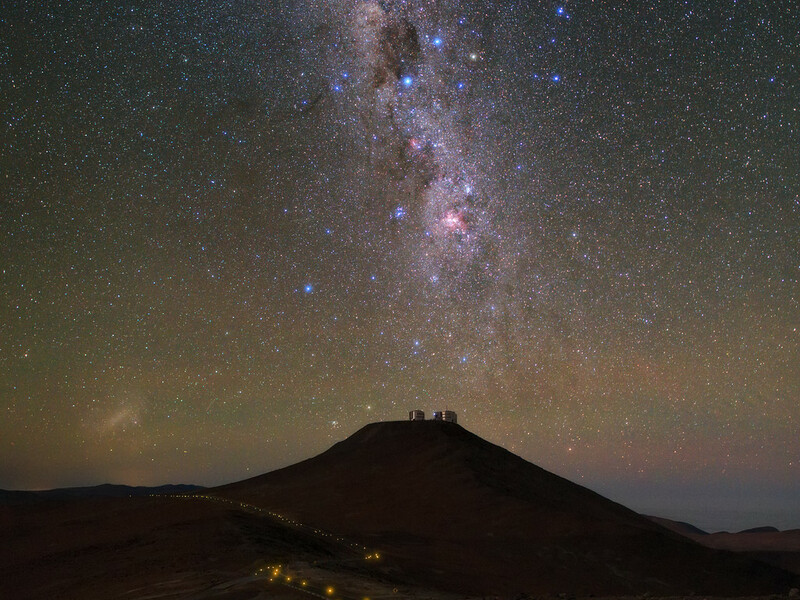 ESO's Very Large Telescope (VLT) looks more like a very small telescope in this image! 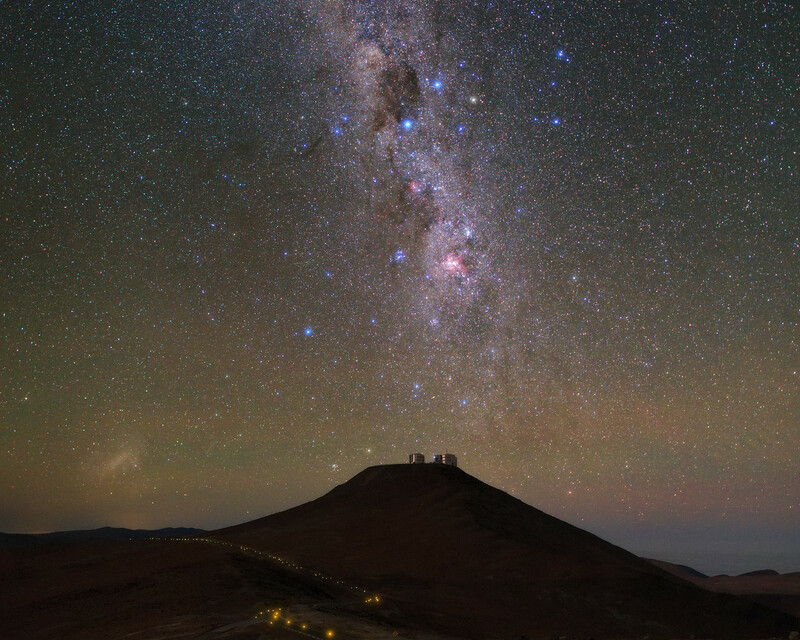 From this perspective, it is difficult to make out the silhouettes of the VLT’s four 8.2-metre Unit Telescopes, which sit atop Cerro Paranal in the Chilean Atacama Desert. The VLT’s location was very carefully selected. It is vital for the site to be as dry as possible, as water vapour can absorb infrared light and degrade observations. 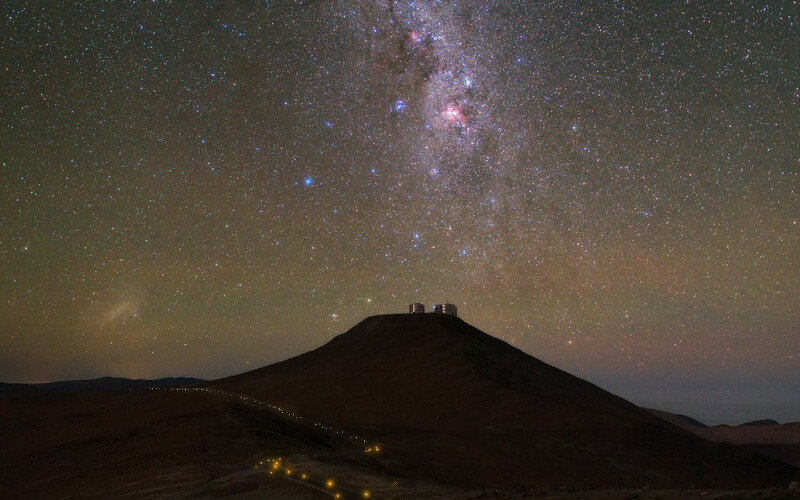 In order to reduce the effects of Earth’s atmosphere as far as possible, the VLT is at 2600 metres above sea level, minimising the amount of atmosphere sitting between it and the stars. Due to its remote location, Paranal manages to be mostly undisturbed and light-free. Even the winding roads that lead through the Atacama Desert to the observation site are dimly lit to avoid unnecessary light pollution. In this image, a trail of stars cuts across the the night sky like smoke rising from a celestial chimney. This is our home galaxy, the Milky Way. Towards the top of the image you can see a brighter and wider section — this is the star-filled galactic bulge, which sits at the heart of the Milky Way.